Pretty much every company will have a different wrapper redemption promotion during the 2012 National Sports Collectors Convention in Baltimore, Maryland from August 2 through August 6. 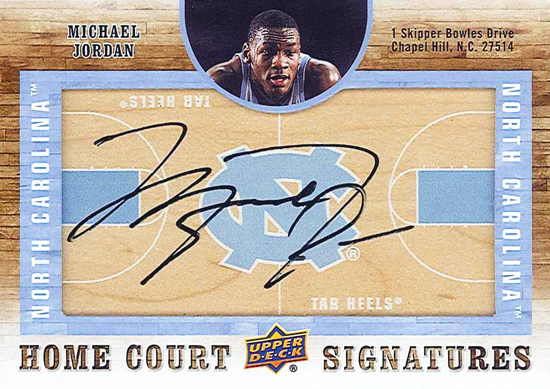 Upper Deck recently announced a very compelling wrapper redemption program with limited autograph inserts from the top athletes in the world and another special program for VIP collectors at the event. 1. Review your outstanding redemptions by logging into your Upper Deck account. 2. Make a determination of which cards you would like shipped to you at the show (cards with a Status of “In house”) and which cards you would like exchanged that are not currently available to ship. 3. 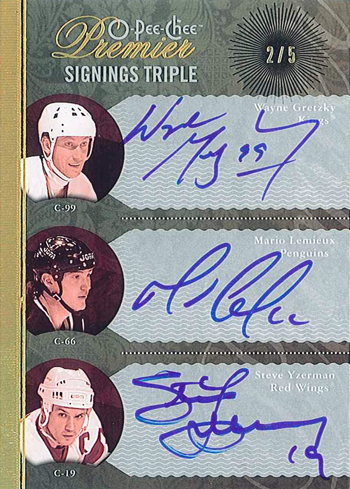 Send an email to time2swap@upperdeck.com with the subject title “2012 NSCC Redemption Program.” In the body of the email, please cut and paste the code and description of the card(s) you would like fulfilled or exchanged. In thirty words or less, describe the type of replacements you would like to receive focusing more on teams, regions and brands you are interested in rather than particular players if the card is not in stock. 4. Requests must be received in by Monday, July 23. Card owners can pick up their redemption package during the show with a government issued identification card. Card owners will also be required to sign for the redemption package in person. Only the actual card owners can pick up the cards, so you cannot pick up items for a friend. 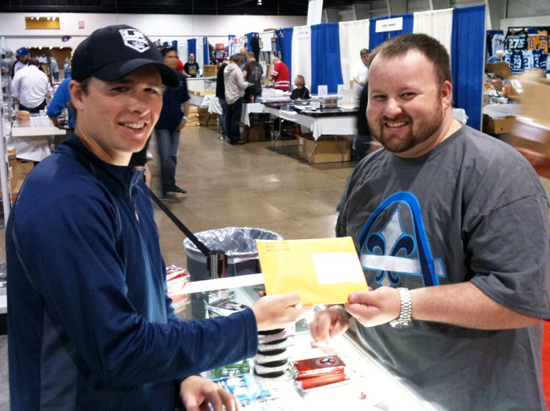 Upon arrival to the Upper Deck booth at the 2012 National Sports Collectors Convention, please provide an Upper Deck representative your government issued identification so they can find you on the list and grab your redemption package. You will then be asked to sign for the redemption package. You can then claim your redemption package from Upper Deck! Open your package and enjoy what you find! Thursday, August 2 – 1:00 p.m. – 6:00 p.m.
Friday, August 3 – 1:00 p.m. – 6:00 p.m.
Saturday, August 4 – 1:00 p.m. – 4:00 p.m. If you do not think you can be at the show any of these days, we ask that you do not request this service. Additionally, if you fail to pick your cards up, you will not be able to request this service in the future and there could be additional delays in getting these cards to you. Additionally, if there is more demand than we can handle to make this program a success, we may have to stop accepting requests before July 23. 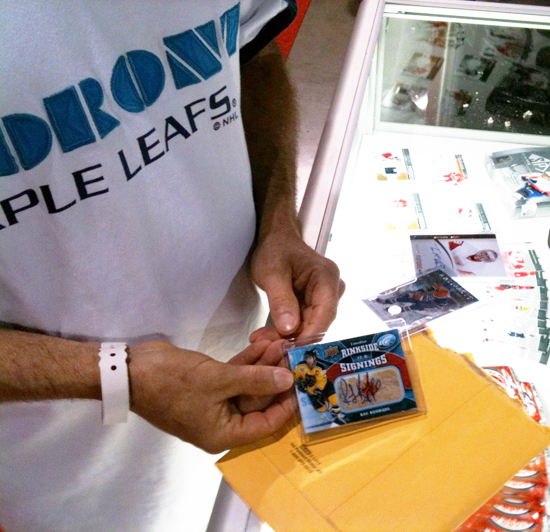 Next, Upper Deck understands collectors get frustrated when pulling redemption cards from any pack. And we also understand collectors get upset when they pull a redemption card that has expired that they can no longer claim. 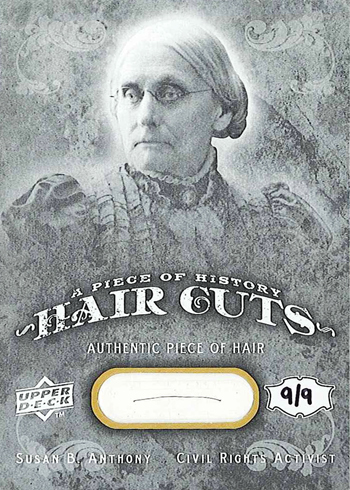 Upper Deck has made a conscientious effort to raise awareness of when redemption cards expire by publishing a “Last Call” list for redemptions. And the best way to avoid issues with expired redemptions is to not put them in the product in the first place. Upper Deck has had significant successes with packing out products with ZERO redemptions this season; most recently 2012 SP Signature Edition Baseball. 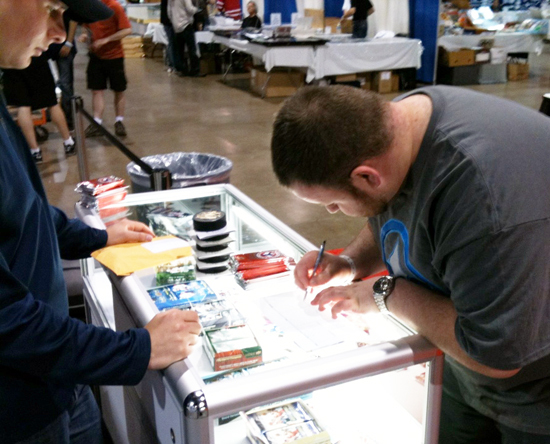 While some releases may be delayed to get more autograph content in, we believe it helps provide collectors with a better pack opening experience if there are fewer, or better yet, zero redemption in the product. That being said, collectors still purchase older products and can have a really negative experience if they find a redemption that has expired from any company. As a one-time event, Upper Deck is excited to offer collectors visiting the 2012 National Sports Collectors Convention a very special experience on Saturday, August 4. Collectors may bring up to five (5) unscratched, expired redemption cards, FROM ANY MAJOR MANUFACTURER, to the Upper Deck Booth before 4:00 p.m. to take part in a special expired redemption card raffle. Upper Deck will have OVER 100 PRIZES available in this raffle consisting mostly of limited autograph cards, but also some select memorabilia and unopened product. “The Upper Deck Redemption Raffle” will begin promptly at 5:00 p.m. on Saturday evening where we will pull unscratched, expired redemption cards for fans in attendance and reward prizes. 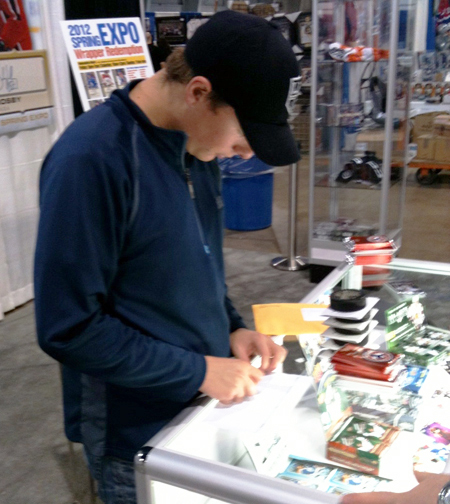 Collectors must be present at the Upper Deck booth during the 2012 National Sports Collectors Convention to win. 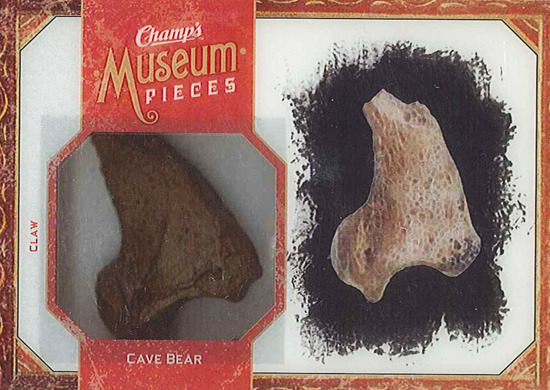 Again, to participate, the cards must be a sports redemption card from any major trading card manufacturer that features a scratch off code that has not been scratched. What are some of the prizes that will be available? We are glad you asked, take a look! This is just one of over 100 amazing prizes that you could win in The Upper Deck Redemption Raffle for expired redemption cards! The items used come from promotional signature stock, items pulled during product review and from expired QA and redemption inventories. To see more prizes available for “The Upper Deck Redemption Raffle” please visit the Upper Deck Booth during the 2012 National Sports Collectors Convention. And if you have questions about either of these programs, please share them in the comment section below. Can the Redemption be from the 90’s? No. They must be from the online redemption era where there is a scratch off code. The code on the card must not be scratched to participate. Some of the other major companies, Topps and Press Pass, do not have scratch offs on the cards. They just have information to fill out and send in the redemption card via email. These are cards that are from around 2008. Are these valid? How exactly will the expired redemption drawing work? Will you like put everyone’s name in a hat who turned in an expired redemption & then draw winners? And will it be a tiered drawing, or can I win that Michael Jordan Auto for instance by turning in an expired Nate McLouth auto redemption. Thanks! Can’t wait for this! Paul, this raffle will only be good for redemption cards that have a scratch off that the scratch off section must not be scratched. Rich, a label will be applied to redemption cards that qualify for the promotion and participants will add their name to the label. Participants can submit up to five total expired redemption cards that have a scratch off area that has not been scratched from any major manufacturer. There will not be a tiered order for the drawing. They will all be eligible for the same prizes. The cards will not be placed into a hat, but likely a large box. The drawing will take place quickly so we can get through all the prizes and you must be present in order to win. We look forward to seeing you there!